- Added a built in Http ASP server. 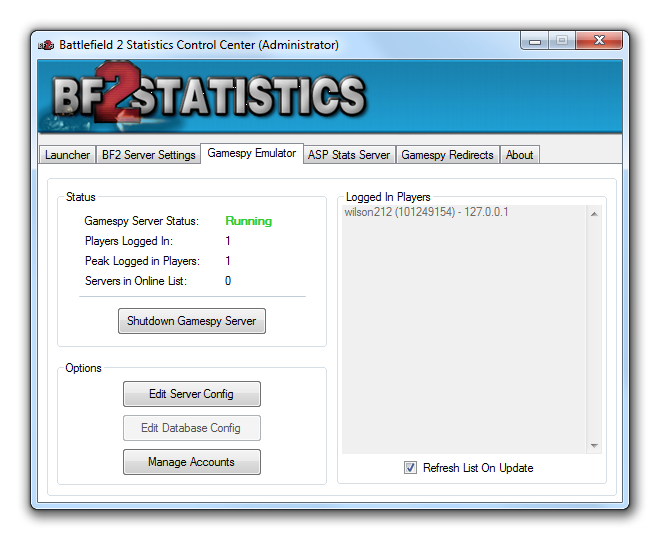 This allows a private bf2stats enabled server to be ran with no Webserver, or database. 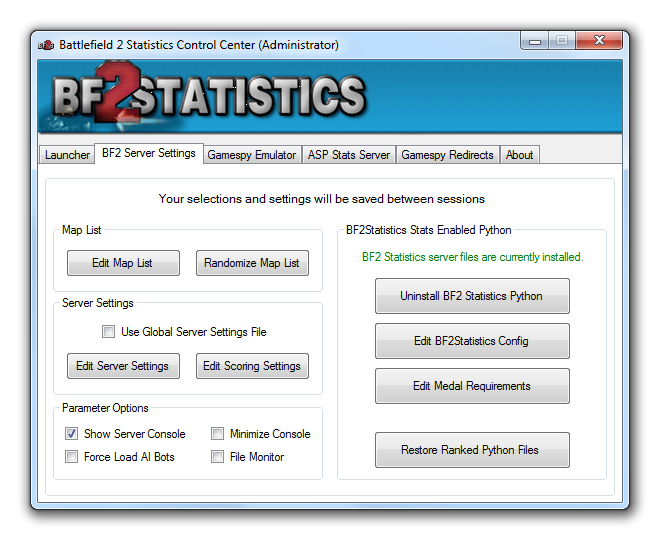 - BF2 Statistics python files now included, and can be installed with this application. - Fixed a bug where people were not able to scroll in the Connected clients screen of the Login Emulator. 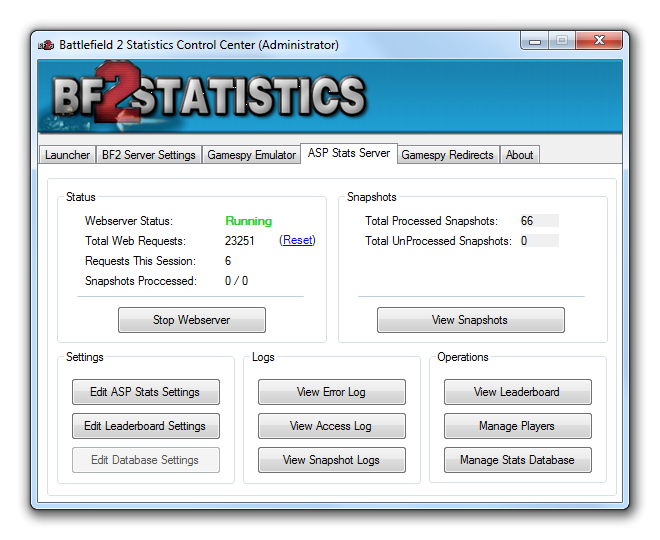 Notes: With the built in ASP server now included, this program is ALL you need to get a local server up and running with bf2statistics enabled. 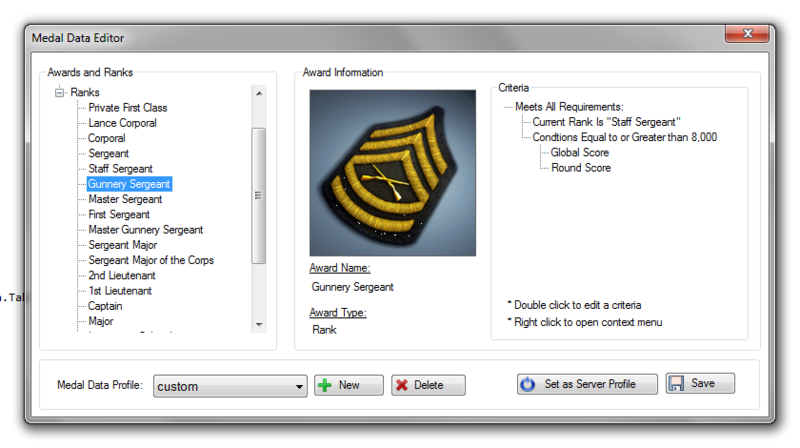 No webserver, or database server is needed, as this application uses Sqlite (file based) database (with optional MySQL connection options), and has a built in Http Server which will handle every call the BF2 client and Servers use to fetch your stats. - New Gamespy Account list menu, Resembling the player search form. - To prevent possible errors, Gamespy accounts can no longer be updated when the player is online. - Gamespy accounts can now be kicked offline by a push of a button. - Fixed a bug that would not correctly set a custom account ID when creating a new Gamespy account. - Fixed a display bug in the player search form, displaying an incorrect amount of search results when using the filter input. - General code cleanup and optimizations. - [ASP] Fixed an issue with the SQLite stats database, causing it to "bloat" after clearing the stats tables. - Fixed a rare issue causing the program to crash on start. - Added path and file checks to a few forms that load and read server files. - Changed status light icons to newer, better looking ones. - Fixed a small bug that wouldnt allow the program to add the localhost entry in the hosts file if it didnt exist. - Host file address text boxes will now remember the last typed address, even between sessions. - Updated: New and Improved server settings screen, including new tooltips. - Updated: New and Improved BF2Statistics Config screen, including tooltips. - Updated: On the Scoring config screen, all text boxes have been replaced with numeric boxes. - Fixed: A crash caused by illegal characters in a maps .desc file in the maplist editor. - Misc: Battlefield 2 client path no longer is no longer required to use this program. - Made the Award name / type boxes read-only, as they should have been. - Fixed an issue when deleting the active server profile, causing the server to crash. - Fixed an issue that caused the medal data form to fail to reload a newly created profile if its position was the same as the old profile in the list. - Added the "Transpose" query string option in the ASP, to print out data in an alternate, easier to read format. Simply just add "&transpose=1" at the end of the query string to any ASP request. - Added a new Error form, to display if any errors happen during runtime, which display various details about the error. - Trace logs will now be generated when an unexpected error occurs, to help with development, and fixing errors. - Various message box popups have been improved, including the addition of icons. - Fixed various GUI control colors being incorrect. - Various other small code optimizations. Every line of code was reviewed, and rewritten as needed. - Added missing "createplayer.aspx" request. - Redesigned the Player editor form. 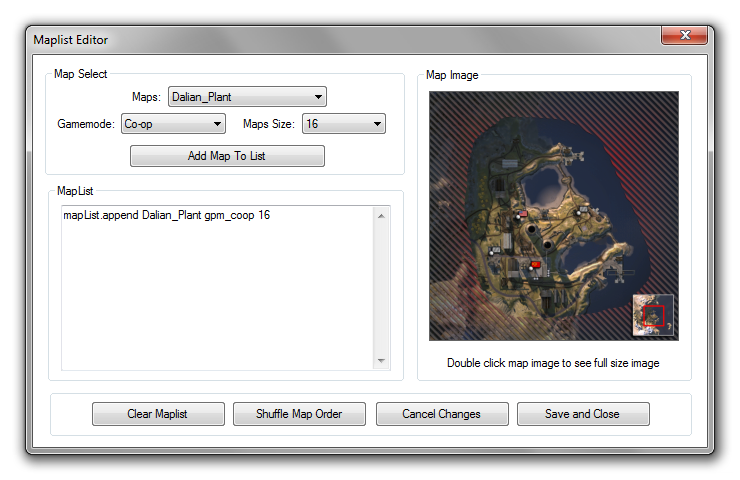 - Added a context menu in the Player view and Account list screens, to display various options. - Added the ability to import player stats from the official EA servers, into the private stats database. - Added the ability to import and export a player's stats via an XML file. - Added the ability to reset a players stats. - Removed dependancy from the gspassenc.exe, which was used to decode gamespy encoded passwords. This is now done internally for increased perfomance and reliability. - Improved reading preformance from the Tcp Socket in the Gamespy login Emulator. - Fixed an error that prevented the saving of changes in the player editor. - Fixed an error that appeared in the Server Settings Editor when the CoopBot Count setting was higher then 64. - Fixed a typo in the AspServer config tooltip for "Ignore AI Stats"
- Fixed a bug that forced a player to logout when an account is first created (Login Emulator). - Various other small optimizations and code changes. Just a small update on this project. Currently im working on an integrated ASP inside the application. 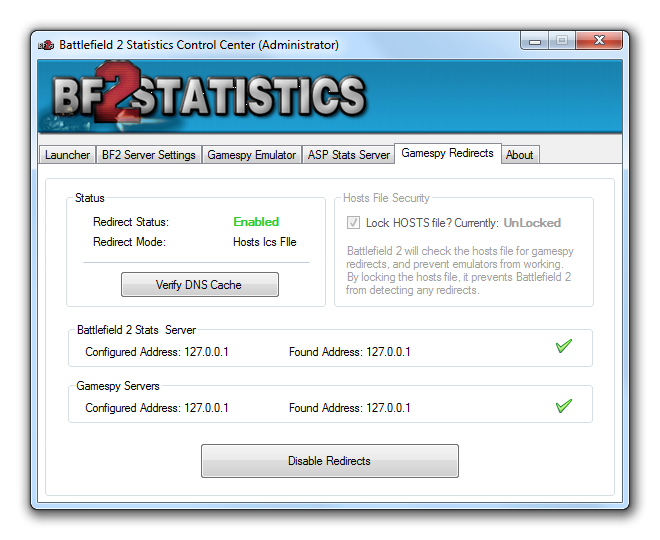 This will allow you to use a BF2Statistics enabled server, without the need of a database and webserver . The application will act as a webserver, and will use SQLite as the database (with the option to connect to an external MySQL server). With this new Integrated ASP, will also add the option to install updated Python files (From Github) with just a click of a button. 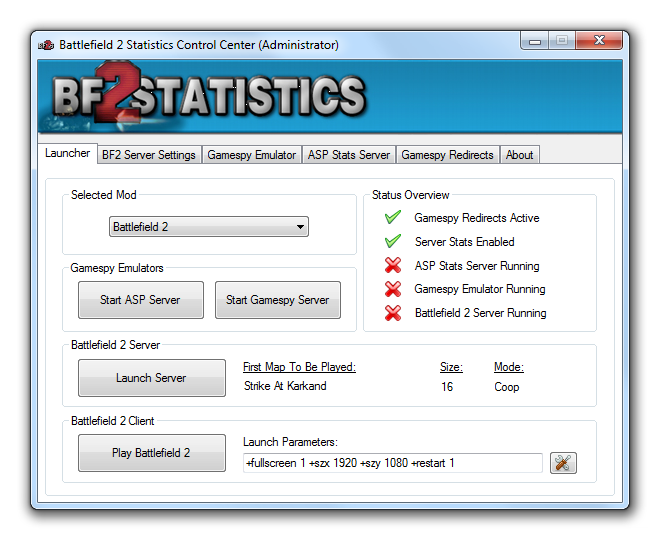 Essentially, To play BF2Statistics, You just install the application, press a few buttons, and You are ready to play on a full, stats enabled server . I should also mention, that this integrated stats system should only be used for personal, or small LAN games. Its not meant to handle tons of servers and players like the normal ASP system. Do you need the official code of ASP? I have bit. I only can give it to developer. The tool was deleted, why? Official code? This is the official code, coded by Chump from scratch! Doesn't get any better that that. While im here. I suppose i can provide an update for you on the progress of the Built in ASP. It is almost done! I have stats working and displaying correctly in the BF2HQ, and all that nonsense. Im currently working on the Snapshot processing. Once that is done, then i just need to add a new tab on the GUI, and design the user interface for the built in Webserver / ASP. Yeah, the coding job he did was amazing! All those lines of code in just a few days is just mindblowing! You have done a great great job as well, and i'm happy that you are keeping this baby alive! I spent roughly a year of my life dedicated to this project, and it's so nice to see that so many can still use it, and have fun with it, especially now that you are simplifying it with this app! I get an APPCRASH whenever I try and start The Control Center. Am I missing a dependecy? How many times have you used the application? (Is this a first time use) ? Also, did you use a previous version before installing this one? I've used this app before for like months straight but recently had to re install windows and after that it started doing that. I've installed all the .nets and visuall c++ stuff . Basically everything my system had before. But before it ran perfectly for months without a hiccup. Do you remember what version you were using before this one (Did the previous version you used have the built-in ASP?)? Can you replace your BF2Statistics.exe with this one, and send me a screen shot of the error that displays? The exe is in the install location of the program (Default is "C:/program files (x86)/BF2Statistics/Control Center/BF2Statistics.exe". You should rename the old one so you can revert back.